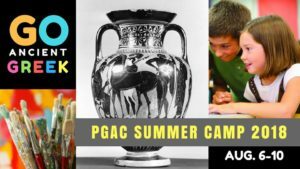 2018 Summer Art Camp at PGAC! For children ages 6 to 10. Only 15 seats are available. Our summer camp program will create a fun and engaging experience for intellectually curious kids who love to learn and play! We’ll explore the culture of ancient Greece through readings, discussions, and conversations. Each day will include a learning session about Greek history and philosophy and an art project related to ancient Greek culture, art and dress. Summer Camp will conclude on Friday, August 10th with an art exhibit and reception for parents at 4:30pm, displaying our student’s creations from the week’s adventures. We’ll spend time outdoors each day, and also allow time for free play and relaxation. 10:15-12:00 Lesson: Intro to archaeology, geography, & language.